That is me, Barbara Barth, with Miss April In Paris, in our professional portrait for my website, Writer With Dogs. I am a writer, a shopkeeper and an events planner. 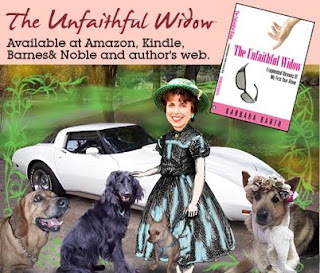 I wrote a book on my first year as a widow, The Unfaithful Widow, doing all those things I never thought I’d do again. It has been called “naughty and cheeky” by an Australian reviewer. Rescue dogs rescued me I like to say. My dogs are a large part of my story and healing process. In January this year, I opened a small antique/gift shop in Old Town, Lilburn, Georgia, about twenty minutes from my house. It is a shop with a twist. Every weekend I hold book signings and art openings. It is a writers’ guild and an art center. Writing and art classes start this month. The shop is a non-traditional venue for artists to share their work with the community. The historic hub is trying to rebuild. In six months I have expanded from one vintage building to three since my events are growing larger every month. I am president of the Merchants Association and work with the other shops to breathe life into the small hub. Many of the events are fundraisers for my favorite animal shelters. I am usually on the computer until all hours of the early morning, either writing promotional material for my shop or my own personal writing. Little Chloe [photo left, with Rascal] likes to crawl behind my back and wedge herself between me and back of the chair. It works wonders for my posture. I write a weekly post for Lifetime Television’s online site for their morning TV show, The Balancing Act. I promote my artists with my blog on the Lilburn Patch.com and like to talk girl talk on Skirt.com. In addition I seem to have as many personal blogs as I have dogs, but who is counting? I’ve been keeping longer hours at the shop and decided the pack and I needed some quality time together. My dogs prefer the indoors to the 98 degree weather we’ve been having in the metro Atlanta area, so our date was in the air conditioned sun room! I am an old fashioned girl and drink plain, caffeinated, black coffee. Folgers breakfast blend is my favorite. I add a few extra scoops to make it strong. Most people refuse to drink my coffee! A nice cucumber or tomato sandwich with mayo on white bread makes me feel like I am at high tea, although I never drink tea. Milk bones minis. They are small and not as fattening. Last year, when I had rotator cuff surgery, and was in a sling for four months, the dogs and I ate comfort food, and we all put on the pounds. When my husband died three years ago I had two German Shepherds. When the male died a year later, my old gal Foxy seemed bored. Her job as caregiver was over. I adopted Bray [photo left], my Afghan mix and the rest is history. In nine months I added five dogs to the pack. 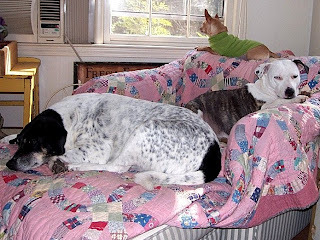 In addition to Bray, there is Annabelle [photo above right], a portly hound dog mix, my seven pound Chi named Chloe, Rascal, a roly poly bull dog, pit mix, and lastly, Miss April In Paris, a spotted hunting dog. 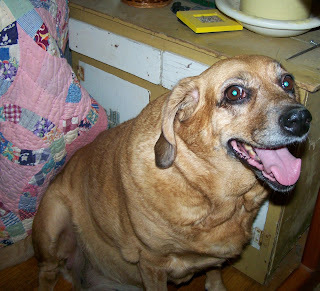 Two months ago Foxy left me as age and health caught up with her. It seems quiet with only five! I am used to counting when they come in after a romp in the yard…1,2,3,4,5…and then I remember there is no number 6. I am working on that now. I like a six-pack at home. Have your dogs had any influence on your writing? I write under the name Writer With Dogs and have a web under that name. I launched a one-time online dog magazine with the same name, in December 2010, dedicated to rescue dogs and vintage dog art. 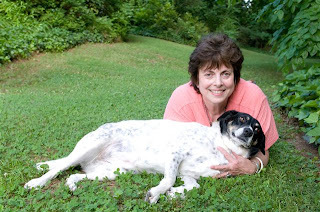 I write about dogs, my rescue groups, living with a house full of fur. I have a dog book in the works. When friends say I am crazy being single with five dogs, I say I’d be crazy without them. They are my writing muses. They make every day a riot of fun! Each dog kept the name it came with. Only April had hers extended. 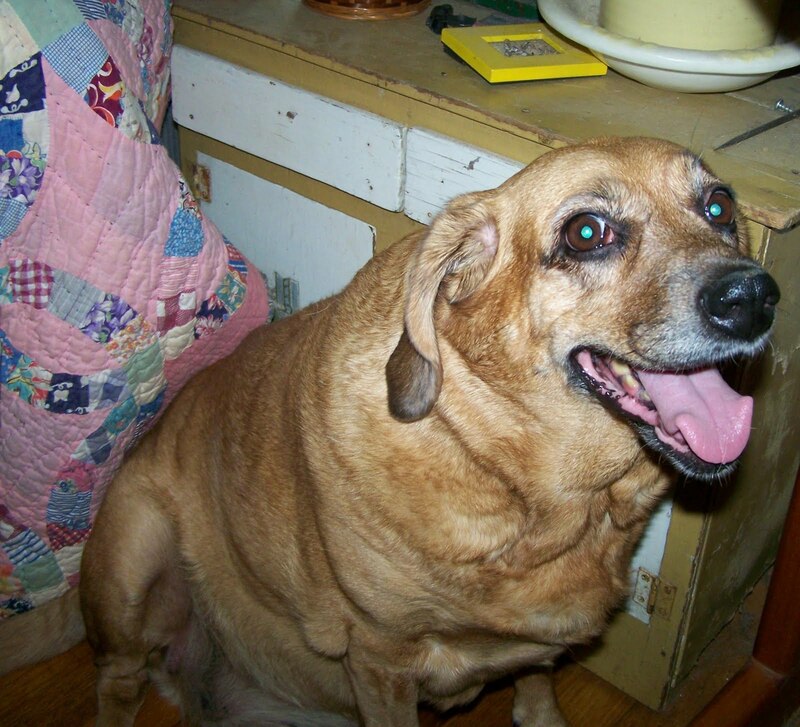 She was the sixth dog when she came in the house, and like the last child, she was somewhat taken for granted. One day she came up to me while I was on the computer, nudged my arm, and took out part of Outlook. I held her face and realized she needed to feel special. “I shall call you Miss April In Paris!” I started a small blog for her, where she is dreaming of visiting the city of lights. She is in my PR photos and, while she has not made it to Paris, she has been on a blog in England. They love to run my fenced yard, which is very private for being close in the city. The occasional trip to the vet, one at a time, is exciting as they enjoy car rides. Mostly they like to stay indoors. My dogs are couch potatoes. Their idea of exercise is to move from the bed, to the couch, to the food bowl. They don’t really care if they go out, but they do like for me to stay in. The dogs are all BFFs. They love to lick each other and play well together. They are a united front. Chloe, the Chi, tries to run the household. She sees that as her job since Foxy is gone. 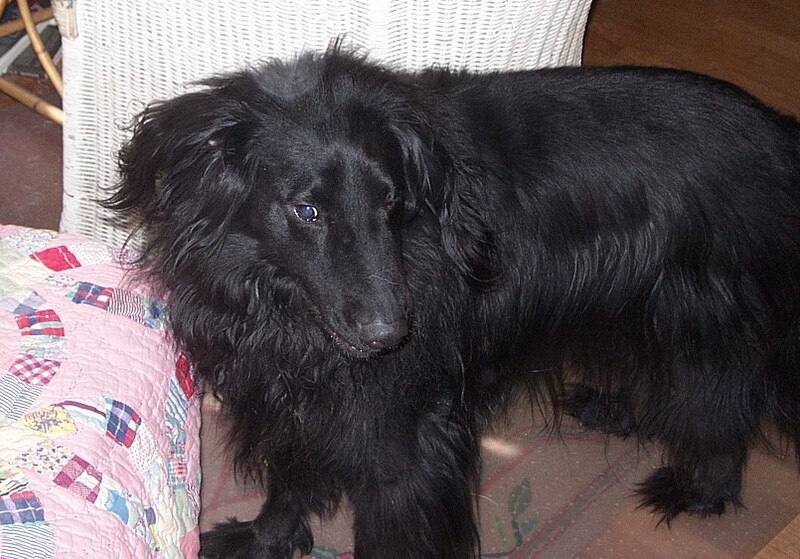 Bray is still skittish and when he comes up to bestow a tiny kiss on your hand, you feel like you’ve won the lottery. If Annabelle could talk, her favorite word would be “whatever”. Nothing bothers her, unless you disturb her sleep. She is the oldest at ten. My other dogs are between three and four years old. Rascal is that chubby girl that sits in the curl of your arm with her head on your chest and stares at you with one blue eye and one brown one. Miss April in Paris looks serious with her dark eyes and dark face, but she is a kisser, which differs from a dog who licks your face. She actually plants a big kiss on your mouth. If only there were a man as good with his kisses. What is each dog's proudest moment? Most embarrassing? My dogs don’t embarrass, however they have been known to embarrass me! 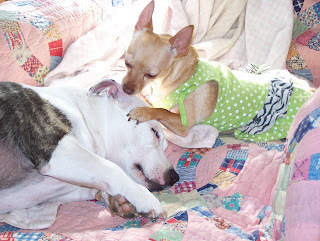 They are happy, well-adjusted, rescue dogs that have found confidence and security at my home. Their proudest moment is when we all run to the bed to sleep at night! They have me sleeping with dogs and I sleep better snuggling with them. Visit the websites for Barbara Barth, the Writer With Dogs, and The Little Shop Of Arts And Antiques.